If you were given the power to bring peace to our troubled world, wouldn’t you use it? In the present climate of fear with the upsurge in violence and terror, the deepening crisis in international conflict and growing uncertainty, we may feel helpless. Sometimes we even begin to lose hope. 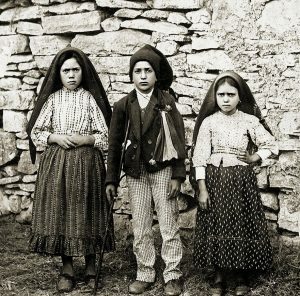 The Fatima visionaries: Lucia Santos, left, with her cousins Francisco and Jacinta Marta, in 1917. Almost 100 years ago, Lucia Santos (later Sr Lucia) revealed how the Virgin Mary had said that God has granted extra power and effectiveness to recitation of the Rosary for our times. This efficacy has been given to such an extent, she was told, that there is no problem in our families, communities, private lives, or the lives of peoples and nations, that cannot be resolved by praying this ancient prayer. It is a supernatural weapon given to us “because the devil has entered into a final and decisive battle in the last times in which we live” and spiritual warfare is intensifying. Perhaps the most extraordinary testament to the Rosary’s power comes from the end of World War II. When the atomic bomb was dropped on Hiroshima, four Jesuit priests were at the centre of the nuclear flash that obliterated everything for kilometres. Miraculously they survived, unharmed, with no signs of radiation. Scientists were, and are still, baffled. In Nagasaki, the same thing happened with a group of friars. They were at ground zero, yet they lived. Within a week the war ended, on August 15, the feast of Mary’s Assumption, and this was the name of the church where the Hiroshima Jesuits were stationed. The Jesuits and the friars believed they were saved by the Fatima prayers, especially the Rosary, which they were praying. After the Nazis withdrew from Austria at the end of World War II, the nation was occupied by the Soviets, who used it as the strategic centrepiece of the Eastern Bloc in their post-war manoeuvres. In obedience to the Virgin Mary’s request at Fatima, 70,000 Austrians collectively agreed to pray the Rosary and, for an unstated reason, the Russians packed up and left the country on May 13, 1955, a key Fatima date. Whenever Christians have gathered in great numbers, united in reciting the Rosary, miracles have happened, wars and invasions been averted, evils and heresies have been overcome. Some devotees can quote their own miracles and experiences of great wonder. Catholic convert and ex-Satanic high priest, Zachary King, who visited New Zealand in February, told of his first encounter with the Rosary when it was prayed outside an abortion clinic he was involved with. He had no idea what the people were “chanting”. He repeated the words, “Hail Mary full of grace”, and the intended abortion had unexpected developments and was abandoned. Again and again he saw the results when Catholics gathered outside clinics praying the Rosary. Originally associated with the 150 Psalms of the Bible, each bead represented one psalm. This was in an age of general illiteracy, before the printing press, when the Rosary was known as “the poor man’s Psalter”. Nowadays it is a Gospel compendium, with the contemplative aspect of visualising scenes from the life of Jesus and Mary set against the almost musical, rhythmical backdrop of the “angelic salutation”, linked by Christ’s prayer, the Our Father, and the trinitarian Glory Be, enveloping the soul in an atmosphere of prayer that engages mind and lips. When the Virgin Mary appeared to St Dominic in 1214, the Rosary assumed its present form along with 15 promises for advocates. One in particular is awesome in its content: We are promised the “entire celestial court” as intercessors during our life!